Please Note: Additional methods to enroll participants include Self Enrollment and the Enroll Users CSV block. 1. Login to Community Moodle. 2. In the Administration block, click the Users option and select Enrolled Users. 3. Select Enroll Users from the top right of the screen. 4. The Assign roles dropdown menu in the top of the window lets you choose the desired role for the participants. -- For a description of roles in Community Moodle, please visit GROK article 19745 - Community Moodle Roles. 5. You can also set a starting date and a duration limit by expanding Enrollment options. 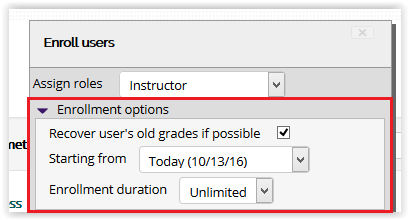 If you set a duration limit, the participant will be un-enrolled from your course after the time you designate. 6 . Type a name or PAWS ID (the first part of the person's LSU email address) in the Search box at the bottom of the window and slick the Search button. 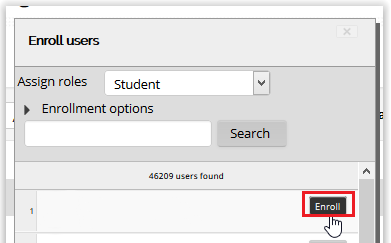 If you click the Finish enrolling users button, the search window will close without searching. 7. When the name of your participant appears in the results box above, click the Enroll button to enroll the person into your course. NOTE: If the name of the participant does not appear and you see the message 0 users found, check to ensure you have entered the correct PAWS ID. If the PAWS ID is correct, contact the participant and ensure they have logged into the system (http://community.moodle2.lsu.edu). 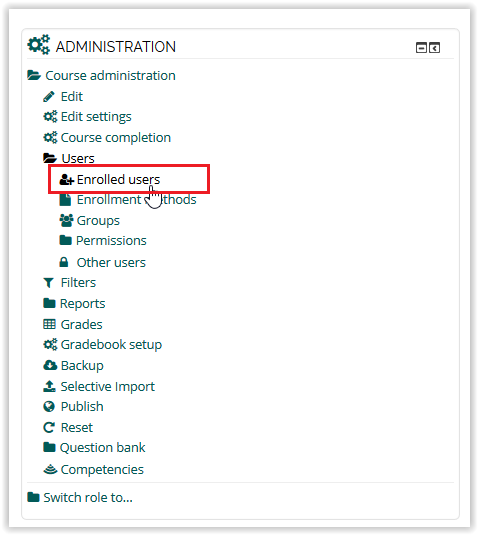 Once they log into Community Moodle, their account will be generated and you will be able to add them to your course. 8. After you click the Enroll button, your participant will be enrolled in your course. Click the Finish enrolling users button to return to the Enrolled User Page. You may remove a person from your course by clicking on the red X symbol next to their name. 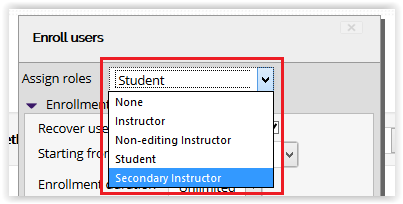 If you add a TA(group) or a Non-primary instructor, you must add them to the group(s) of students in order for them to be able to enter grades in the gradebook, or email the students.